The Raheel-Nawaz regime in collaboration with their companion in slavery to America, the Saudi government of King Salman, arranged for the Imam of Kaaba to Pakistan to exploit the religious emotions of Muslims and to deceive them in to supporting the tyrannical regime of Saudi Arabia and the criminal rulers of Pakistan. 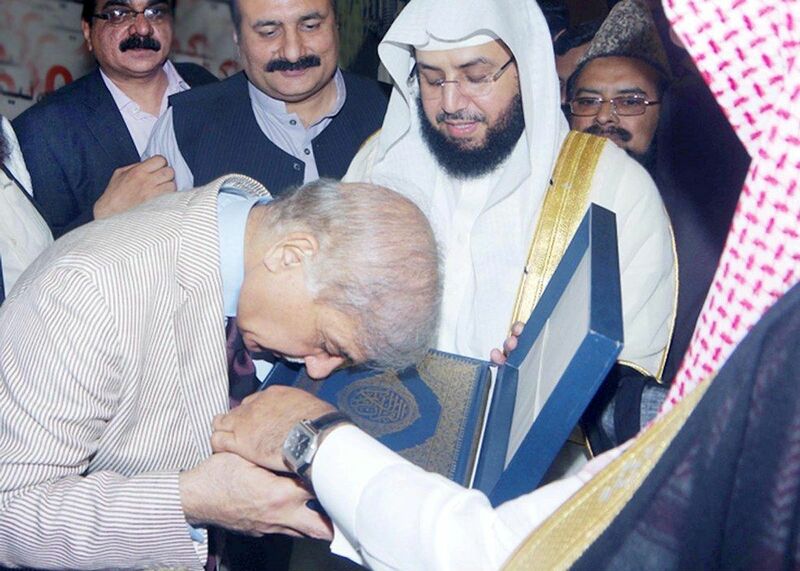 Distributing rugs with Quranic verses and copies of the Quran among Pakistani politicians, the Imam of Kaaba used the media attention that the regime provided for him to peddle out the American line on the issue of Yemen. He also supported America's war on Islam being fought in the tribal region by pro-American rulers. Is this what the regime should arrange for the Ulema to speak about?! Is it not aware of the American occupation of Afghanistan and its violation of Islam and the rights of Muslims? Does the regime care about the current status of Palestine or does it consider the Jewish occupation of the blessed land as legitimate? Does the regime not know about Syria and the mass killings of hundreds of thousands of Muslims at the hands of the tyrant Bashar? So why did the regime not benefit of the Imam of the House of Allah (swt) to motivate the Muslim armies for these Islamic causes and to end the misery of Muslims across the globe? Or is it that the regime only approves for Ulema to speak for the pleasure of its masters in Washington and will silence any voice for Islam, Jihad and Khilafah? "I saw the Messenger of Allah (ﷺ) circumambulating the Ka’bah and saying: ‘How good you are and how good is your fragrance; how great you are and how great is your sanctity. By the One in Whose Hand is the soul of Muhammad, the sanctity of the believer is greater before Allah than your sanctity, his blood and his wealth, and to think anything but good of him." It is upon the righteous Ulema and Islamic politicians to speak the truth and categorically reject the bidding of the rulers, saving themselves from disgrace in this life and the next. It is upon them to account these rulers, advise them through Islam and not fear their wrath, for it is not befitting for the one who has knowledge of the Deen that he puts the fear of the tyrant before the fear of Allah.